Steve Lee, former director of the Union Pacific Heritage Program, is one of those people who needs no introduction. 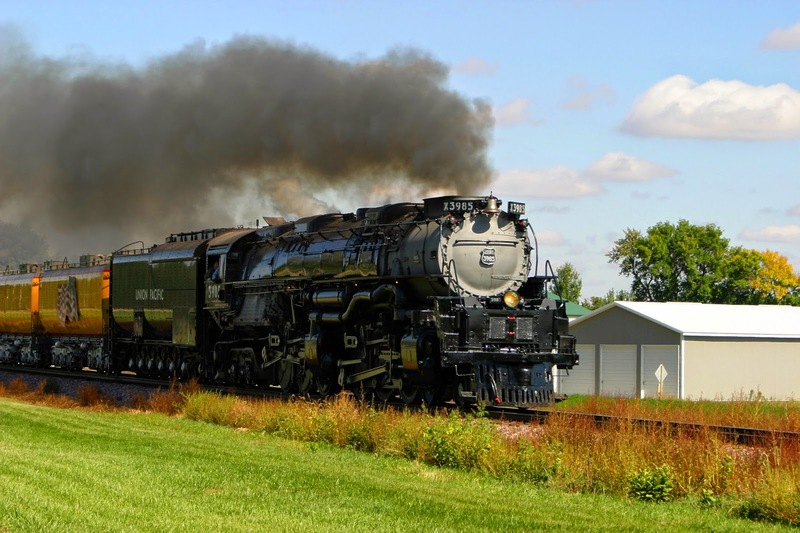 During his tenure, he managed excursion trips headed by the Union Pacific’s two steam locomotives, the 844 and the 3985, as well as several vintage diesel locomotives. He is quite generous with his time, and granted me the great honor and privilege of an interview for the F-O-F. Since there is already quite a bit of technical information about the locomotives in the Heritage Fleet, I decided instead to ask Mr. Lee about the staggering amount of planning and logistics that went into putting together a mainline steam excursion. Mr. Lee stressed several times during the interview that he cannot speak for the way that the program was managed before or after his tenure. I began as an engineer for the Illinois Central Line from 1972-1977. After that, I was a road foreman and trainmaster on the Rock Island Line. In 1982 I became the operating officer for the Union Pacific’s Heritage Program. In this position I oversaw the crew members and was responsible for their safety. In 1988, I became the road foreman of the entire heritage program and the steam shop, and kept this position until I retired in 2011. Why did Union Pacific select you to run the program? I was a road foreman in Cheyenne when they chose me. I got the job mostly because no one else wanted it. It was thrust upon me. It wasn’t politically popular to do the steam program at the time when I started--the management didn’t realize its PR value at that point, and managers thought it was a dead-end job. Management didn’t realize how much skill went into coordinating the excursions, and didn’t think that anything the workers did while they were in the Heritage Program applied to the modern railroad. At first, I was managing the Heritage Program on top of my normal foreman duties. That went on for four or five years before it dawned on the managers in Omaha that it was a full time job and they relieved me of the road foreman’s duties. That took care of that! The managers’ attitudes towards the program became more friendly by the end of my career, though not as much as it should have. The problem is that you can’t put a number on how much good PR the Heritage Program brings in. Management can’t understand that without the steam engines and their excursions being in the news, the only press the Union Pacific got would be about tying up level crossing or blowing stuff up and evacuating towns. Or collisions, and too much noise from the train horns. As the program grew, though, and as the managers above me moved up in the the hierarchy, a lot of them became more broad-thinking and viewed the Heritage Program in a different light. They get high enough up to see the benefit coming in PR from counties, states, the national level. We’ve had congressmen and presidents on the train. As long as we didn’t do anything stupid, they started to support us. How many excursions did you participate in during your tenure? How much geographical territory did they cover? I supervised about 175 excursions during my career with the Union Pacific. They covered all of the Union Pacific’s territory. How long was a typical excursion? The length varied greatly. Some of the outings were only 3 or 4 days, some were 5 weeks long. The longest one I can remember was 62 days in length. Tell us about the planning and preparations that went into putting together a Heritage Program expedition. The Steam Shop and the Union Pacific Public Relations team put an incredible amount of planning into these trips. We would start months or even a year before, because we had to plan for every single thing that happened. First, we had to decide where we wanted to go, and what we wanted to do. It made more financial sense to go to as many events on one trip as possible. We would attend state centennials, benefits for different art groups and symphonies, a few Super Bowls, benefits for Make-a-Wish Foundation and other charities. We ran a whole train of kids with terminal cancer out of Houston once. Sometimes, we would just take the engines out and put them on display. Once we had worked out what we wanted to do, we had to figure out if it was possible to get there. We would have to plan our route carefully to make sure that the steam engines would fit on the tracks, and if there were sidings where we could park the excursion. We investigated every little detail about the towns where we planned to stop for maintenance, layovers, and events. We had to choose where we would stop carefully, because we knew that the public would want to come out to see the steam engines. We wanted a location that was as accessible and safe as possible.We did not want to park in locations where onlookers would be tempted to wander into railyards or might be in danger from other pieces of railroad equipment. The Union Pacific Public Relations team wanted us to stop in places that had a defined street address. That way, they could get in contact with local newspapers, schools, and other organizations in order to spread the word that we could be coming. We also wanted the locations where we stopped overnight to be as safe for the crew, our equipment, and the public. We would park as far away from active freight tracks as possible. We did not want members of the public to endanger themselves by getting too close to the locomotive or rolling stock without supervision. Occasionally, we had problems with vandals and had to leave a guard with the train overnight. Did excursions always have passengers? And what kind of rolling stock made up the train? We didn’t always have passengers. Only sometimes. When we brought them we would have coaches, dome cars, a diner car, a baggage car, and a business car. We always had a tool car. It was like a “rolling Home Depot.” The crew members rode in there when the train was moving. How did you account for the crew’s living quarters, food needs, and any medical attention they might have required? We had crew quarters on the train, but we always stayed in hotels when on the road. They were far more comfortable, and that way we didn’t have interruptions from members of the public trying to talk to us or get pictures when we were trying to rest. At hotels, we could also do our laundry and swim. We had a thing we called the steam shower. When we got to the hotel, we would take two beers in the shower, and drink them while showering. We also had a kitchen on the train, but other than microwaving snacks, we seldom used it. We usually ate out, or arranged for Union Pacific fleet trucks to meet us for food. We liked to have KFC and Whataburger, when we were in Texas. At the end of the day we always liked to eat out--that was another thing we planned for when we were putting the excursions together. We would also bring along an EMT or a medical technician, even a full doctor when we had passengers. People would always forget their medicine, or diabetics wouldn’t bring their insulin. He wrote them prescriptions and would take care of any of the crew members who got minor injuries, or members of the public who might sprain an ankle or something while walking around the tracks. All of the crew members were trained in CPR and basic first aid, and we carried an AED on the train. How did you arrange to get additional fuel and water to the locomotives, especially when traveling through very rural areas? Before the excursions went out, we would arrange for fuel trucks to meet us at pre-determined locations. We would work out the exact specifications of when and where to meet us. These were companies contracted by the UP and over time, they got very good at knowing exactly what kind of fuel we needed and how much of it we would use. As for water, we would make sure to plan stops that were near a fire hydrant. We just used the city water. We would go through all three tenders and need to fill up with 80,000 gallons every night. We carried our own fire hoses and hydrant wrenches on the train, so we didn’t have to burden the city fire department. We worked out payment to the city up front, and would alert them before we came to town so no one would think we were terrorists messing with the city’s water supply. Did the crew members stay with the train for the entire time, during these longer excursions, or do they switch off with other people? They stay the duration of the excursion. What qualifications did you look for in potential steam shop employees? There were several main things that I looked for. Potential employees needed to be good mechanics and fast learners. They needed to know how to look at something that was malfunctioning--whether it was electric, mechanical, or whatever-- and know what’s wrong and fix it quick. Did these potential crew members approach you about joining the Heritage Program, or did the Union Pacific management assign them to you? The steam crew was more of a family than a group of employees. People who came into the program tended to sign on and then stay with us for the rest of their careers. When one of them retired, or, unfortunately, passed away, I would ask the other employees for recommendations. They never did me wrong! Everyone they suggested fit in well. They added value to the team. Was there a lot of competition to work at the steam shop and on the steam crews? I used to have a files of people who wanted to come on that were a few inches thick. Most of the time I went with recommendations from the other crew members, but every now and then I got somebody out of the folders when we needed to quickly procure a temporary crew member. I would occasionally select younger people out of the folders in order to teach them about running and maintaining the steam locomotives. How many crew members went on each excursion? There are typically two engineers and two firemen who swap shifts. We also bring a full mechanical crew, including a foreman, a boilermaker, and skilled machinists. There is also a conductor who knows the territory we are traveling through. We have to have him there to satisfy union rules, as well. On passenger runs, we also had a conductor to punch passengers' tickets. We sometimes brought a car that was set up to sell souvenirs to the public. This would typically be staffed by the crew members' wives. Give us an idea of the sort of routine maintenance the crew members performed while on the road. We would grease all the locomotive’s moving parts, refuel and take on more water, wash down the boiler, and take care of the rolling stock in the train. If we used a diesel helper, we would arrange for that to be brought to the excursion train and take care of any issues on that locomotive, too. Generally, we used whatever freight locomotives were on hand if we required a diesel helper. Sometimes we would use one of the diesels from the Heritage Fleet, if it wasn’t an inconvenience to get it to the the excursion train. There were parts of the excursion routes where there were steep hills, and we needed to have a diesel to use its dynamic braking. We used to come through Portola, California, where it was downhill for 112 miles. We would pick up a diesel there and take it as far as Sacramento, and then leave it behind. There were also some areas in Utah where the tracks went through a lot of long tunnels. We would take a diesel through those routes so we could reduce the steam engines’ fire through the tunnels and let the diesel push us through. If we didn’t do that, the smoke and exhaust would be so thick that the crew would be at very real risk of asphyxiating, and all the soot would blow back onto the train. We didn’t want to take passengers in there, and have them come out of a tunnel with their windows completely black. In a previous article, several people commented about a device that the Heritage Fleet and the crew of the SP 4449 used to synchronize a steam engine with a diesel helper. Can you explain this? It’s kind of handy. You don’t have to use the radio. You just have a little box that goes with the throttle and reverser and makes the diesel do what you want. You can shut the diesel off from the steam engine’s cab if you want. It worked through the MU cable, what you are doing is running two different kinds of locomotives from one place. The device basically let you put the diesel’s controls in the steam engine’s cab. Has the crew ever suffered a breakdown on the road? Yes, but the tool car carries spare parts, welders, machining equipment, just about everything we needed to fix anything that went wrong. What sort of breakdowns did you consider the “worst case scenario” that would have required you to cancel the excursion? We would have had to go home if we had, say, a broken flue, but the crew could have fixed that up enough to limp home to Cheyenne. Most things could be fixed on the road. The only things that would have required us to call in help might have been major wheel problem, such as a broken tire or siderod, or significant boiler failure. There could sometimes be months or almost years between steam runs. What did the Steam Shop crew during these layovers? We would replace the brake shoes and the rod brasses (the bearings on crankpins). We would have to do all the normal things that steam locomotives needed. We also did all the repairs for the rail cars that made up the excursion trains. We would fix their lighting and air conditioning, repair their generators and wheel trucks, generally keep them in good condition. Another thing that we would do between trips was manufacture backup parts to take with us on the road. After a while, we had done enough excursions that we could predict which parts we would need, and would always keep them with us. Of course, then we would break something that we didn’t think we would need! We took raw materials with us for unexpected repairs, so the mechanics could manufacture the parts that we didn’t produce in the shop. It was difficult to find materials on the road. Many of the places we traveled through were so rural that there were no suppliers in the area, and even in larger cities, we couldn’t count on being able to purchase the very specific kinds of metal that we needed. A/N: Thanks to the people who helped set up this interview. You know who you are! The view expressed in this interview do not necessarily represent the views of the Friends of the Flange blog.